(CNN) - The congressional impasse on immigration may be a political calculation by some Democrats, Sen. Marco Rubio said in a television appearance on Wednesday. "And I think for some - not all - but for some Democrats, the issue of immigration is better politically if they just leave it the way it is now because they can use it against Republicans," Rubio added. Rubio's comments came after his keynote address Wednesday at the Latino Coalition Annual Economic Summit, which earlier heard from GOP presidential candidate Mitt Romney. Rubio has been floated by some - but has pushed back against such suggestions - as a possible vice presidential pick for Romney in part because of his Hispanic heritage and the potential influence of Hispanic voters this election cycle. In the interview, he said the "perpetual campaign" and hyper-polarization has led to predetermined votes, rather than policy decisions, stacking up on the Senate floor. Some, however, considered his party's series of votes on competing budget measures earlier this month to be a similar stunt, as none of the five were expected to pass. In his speech on Wednesday, Rubio criticized the rhetoric of President Barack Obama, saying "What you have today is nothing less than a wholesale effort to pit one group of Americans against each other on issue after issue." A poll released Wednesday showed Obama with a significant lead over Romney among Latino voters. The NBC News/Wall Street Journal/Telemundo survey showed 61% backed Obama and 27% favored Romney. Rubio where is your Dream Act Plan in writing? 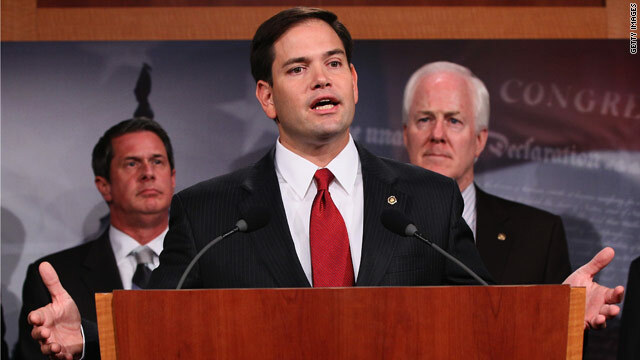 If Rubio's Dream Act Plan so good let's have a vote and where are all those Republicans clambering to vote. The truth Republicans think Latinos are inferior to them. The "Anchor Baby" speaks about immigration. This preppy pretends to be a Latino but he's just another well-paid coconut. Rubio is a really smart guy, but of course the Lefty Loon Haters will immediately get defensive and start attacking him about anything that doesn,t matter. Geezisss!! Is he still talking. Oh yeah, the Latino community so looks up to Rubio for ideology and representation....NOT!! The Latino community ain't dumb enough to buy into it, especially coming from him. Better try a different shill. Good Luck!! "I think there are some in the Democratic Party – not all – but I think there are some people in the Democratic Party that think that the immigration issue is more valuable to them unsolved,"
Obama was born in the USA ! You want to see Immigration impulse solved? Then Rubio is the right guy!! with Dems is just talk talk talk more lies and political manipulation. The only ones that treats minorities like second class citizens are the republicans now who's fault is it that their on the democratic side again? When are you going to pay back the money you stole on your Gop credit card Rubio???? All these words and propaganda from the tepublican party of no ,no ,no and obstruction!!!! Where is the unhinged GOBP immigration bill? They were too busy waging War on women and talking about self deportation. The complete hypocrisy and total lack of self awareness by those on the right is astounding. Rubio, like most republicans, would not know the truth if his life depended on it. He is posturing to become the running mate of Mittens, the lying flip flopper. Both Mittens and Rubio are anchor babies and they need to self deport. Is it just me or do you see the same thing...a forked tongue? I don't trust this man from the word GO! Hey Mark- where's your birth certificate? Shouldn't be too hard to find, did you look behind the refrigerator? Perhaps it's tucked down between the cushions on the couch, or maybe you left it behind in Cuba. Whatever, I'm sure you'd be happy to show it to all of us, if that's not too much to ask.